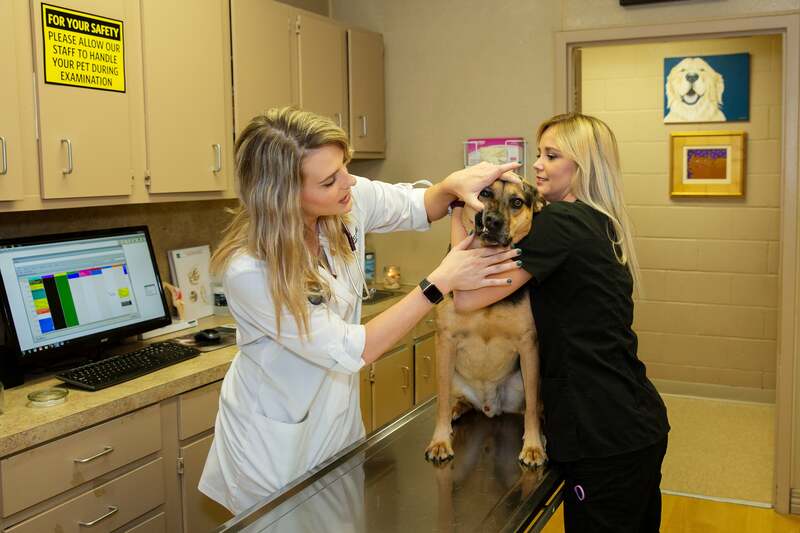 Once a year your pet will receive a complete and thorough physical examination by a veterinarian. During the exam all body systems are checked from nose to toes. Ears, eyes, skin, teeth, mouth, heart, lungs and more are all examined. For dogs in Arkansas a heartworm and intestinal parasite check is performed annually. This is so important for our canine companions as heartworms and intestinal parasites are common in our area. Intestinal parasite exams are also encouraged for our feline friends. For our senior dogs and cats (7 years+) wellness bloodwork is always recommended to have a normal baseline and evaluate for potential problems before issues occur. Rabies: This is a CORE vaccine required by law in Pulaski County. The first Rabies vaccine is good for 1 year, then every 3 years as long as the vaccines are on time! DAPP: Distemper, parvo, parainfluenza oh my! This CORE vaccine is given in a series for puppies, and either annually or every 3 years for adult dogs depending on previous vaccine history. Leptospirosis: This bacterial disease is spread by small mammals and enters the skin through cuts or by oral ingestion. It is a deadly disease that also can be transmitted to humans. This vaccine is annual. Canine Influenza: This annual vaccine is recommended for pets that are highly social -- dog parks, doggy day care, dog shows, agility and boarding. FVRCP: Feline rhinotracheitis-calici-panleukopenia vaccine may be a mouthful but is a CORE vaccine for all cats! The frequency of this vaccine is dependent upon vaccine history but usually is every 3 years in adult cats. FeLV: Feline leukemia is a disease that is spread by sharing water bowls and grooming. This vaccine is recommended for cats that are outdoor or share their living quarters with other kitties. Is there anything better than a puppy’s sweet wet kiss or a kitten’s soft purr? We don’t think so! The addition of a new kitten or puppy is exciting but brings lots of responsibility. Call us today to set up your first appointment and we will get your new fur friend on the right track to a healthy life. Love them! Always friendly and great service! I take all three of my boxer babies there!